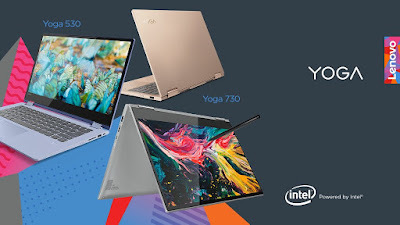 Lenovo Yoga 730 is powered by up to 8th Gen Intel Core i7 processors, optional NVIDIA GeForce GTX 1050 discrete graphics (on the 15-inch Yoga 730). Even though it is a mid-range device, Lenovo 730 can be configured with up to a UHD IPS touchscreen display. Whereas FHD IPS touchscreen display is a standard on the Yoga 530.To support Windows Inking experience, Lenovo has added support for Lenovo Active Pen 2 with 4,096 levels of sensitivity on these devices. There is an integrated fingerprint reader for supporting Windows Hello authentication. The Yoga 730 can be connected to a 4K display through its new Thunderbolt 3 port. Lenovo also highlighted that Lenovo Yoga 730 is more portable than other devices in its class. The 15-inch Yoga 730 is just 1.89 kg, 1.12 kg for the 13-inch model. The device is encased in a polished and durable anodized aluminum casing with your choice of premium Platinum and Iron Grey colors. The 14-inch Yoga 530 weighs just 1.6 kg. It’s 11 percent thinner than before at just 17.6mm. Lenovo claims that the new Yoga 730 will offer a battery life of up to 11.5 hours on the 13-inch model and up to 11 hours on the 15-inch in FHD model. They also support fast charging, in just 15 minutes you can get up to 2 hours of usage of your Yoga 530 and 13-inch Yoga 730. The 13-inch Yoga 730 with Lenovo Active Pen 2 included will start at €999 (VAT included), will be available in April. The 15-inch model with Lenovo Active Pen 2 included will start at €1,099 (VAT included), will be available in April. 14-inch Yoga 530 will start at €549 (VAT included), will be available in June.